Porsche has launched the 911 GT2 RS in India at the price of Rs 3.88 crore (ex-showroom). The 911 GT2 RS is the most powerful version of the 911 in India and is the quickest too, posting a 0-100kmph time of 2.8 seconds. The GT2 RS is also the most expensive 911 in India followed by the 911 Turbo S Exclusive Series, which is priced at Rs 3.56 crore (ex-showroom). Both the GT2 RS and the Turbo S Exclusive Series are powered by a 3.8-litre engine. But in the GT2 RS, the engine is tuned to produce 700PS of maximum power, 93PS more than in the 911 Turbo S Exclusive Series. The GT2 RS is also faster than the Turbo S Exclusive, but only by a margin of one-tenth of a second. While the 911 GT2 RS is a RWD machine, the Turbo S Exclusive features an AWD setup. Read the GT2 RS launch story here for more information. Apart from the GT2 RS and Turbo S Exclusive Series, the 911 Carrera, 911 Turbo and 911 GT3 models are on sale in India as of July 2018. The claimed ARAI mileage: Porsche 911 2016-2019 Petrol is 14.2 kmpl. The claimed ARAI mileage for the automatic variant: Porsche 911 2016-2019 Petrol is 12.9 kmpl. The track-fanatic version of the rear-engined sports car gets its juices from a naturally aspirated 4.0-litre, flat-six powerplant! 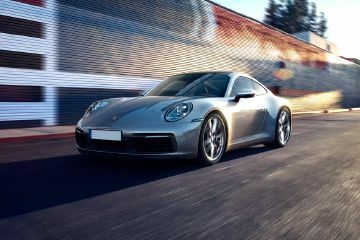 The ‘R’ label stands for ‘Racing’ at Porsche, and it is the only one of the 991 units produced globally to arrive in India.